Well, I suppose that is better than calling them the Panel of so-called Experts. But not much. The release of the report created a minor controversy. 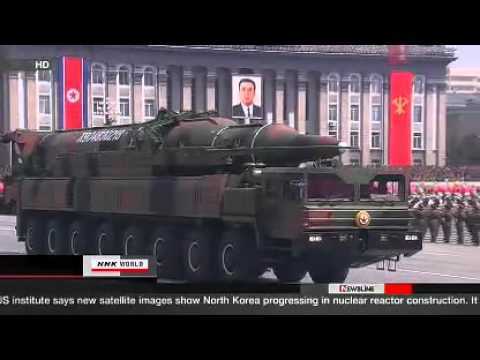 The Panel of Experts (POE), which reports to the UN Security Council’s Sanctions Committee for the DPRK, noted that North Korea appeared to have imported six “transporter-erector-launchers” or TELs that North Korea paraded through Pyongyang armed with a new type of ICBM. Although the TELs were visually identical to a vehicle produced by China’s Wanshan Special Vehicle Company, the report did not mention China’s role in exporting the vehicles. Apparently the TELs exported themselves. Rumors quickly circulated among the policy community, as noted by Mark Hibbs on my blog ArmsControlWonk.com, that China had agreed to release the report on the condition that the POE not name China as the source of the vehicles—despite overwhelming evidence that this was the case. This was at least the second time China sought to block the publication of a Panel of Experts report. The Chinese representative refused to sign the 2011 report, permanently consigning it to the status of a “draft” that could not be released to the public. It promptly leaked to the Weekly Standard. Naturally, some of my colleagues have begun to wonder whether such a panel is really worth all the fuss. Generally, I think the answer is yes. The UN system often relies on panels of experts, particularly when issues require special expertise. There are too many such panels to count. Well, too many for me to count. Then again, I am lazy. On the subject of UN Security Council (UNSC) sanctions alone, nine of thirteen Sanctions Committees that monitor sanctions implementation have either a panel or group of experts. There are experts for Somalia and Eritrea, Al-Qaeda, Liberia, the Democratic Republic of the Congo, Côte d’Ivoire, Sudan, Libya, Iran, and, of course, North Korea. It was not always so—or at least not for North Korea. The United Nations Security Council Resolution (UNSCR) 1718, passed following North Korea’s 2006 nuclear test, created a Sanctions Committee but not a Panel of Experts. In 2009, following North Korea’s second nuclear test, the UN Security Council included in UNSCR 1874 a provision for the creation of a seven-member POE to staff the Committee on DPRK Sanctions (sometimes called the 1718 Committee after UNSCR 1718). Although such a panel might reasonably be expected to assist in monitoring sanctions and assisting states to implement their obligations under the resolution, it is hard not to see the POE as a punitive measure given this history. Oh, you conducted a nuclear test? How about we pay seven full-time staff members to document your every misdeed? We initially thought about bloggers, but there are civil servants we’d like to pay to work someplace else. The DPRK POE is not, however, like any other such-panel—in large part, because the relationship between China and North Korea is unlike any other relationship between a permanent member of the Security Council and a state under heavy sanctions pressure. It is too much to expect the DPRK POE to be free of the complications that arise from this unusual relationship. Unsurprisingly, the DPRK POE has been beset with issues from the beginning. The first twist, interestingly enough, had nothing to do with China. (Much of the following accounts are drawn from leaked US State Department cables released by Wikileaks.) During the negotiations over UNSCR 1874, the major players reached an informal understanding that the seven member committee would include representatives from the P5 plus Japan and South Korea. There is a certain logic to this arrangement—the United States, China, and Russia will obviously insist on participation. The United Kingdom and France are unwilling to cede their prerogatives as permanent members of the Security Council, while Japan and South Korea have obvious interests at stake. Someone, however, forgot to tell Mexico and Costa Rica. As a general rule, the United Nations system works on the basis of geographic balance, to say nothing of other concerns such as ensuring appropriate linguistic and gender diversity. Mexico and Costa Rica made it clear that they were not willing to go along with an expert panel that did not include a Latin American. Burkina Faso, Libya and Uganda supported the notion. Yes, for a while the UN had a Mexican stand-off. Eventually, Mexico and Costa Rica were encouraged to put forth a Latin American expert for the Sudan Panel of Experts, which mollified them. The Panel of Experts was not going to meet the original 90-day deadline for an interim report. The Secretary-General finally named the seven experts in August 2009. The usual human resources delays—one member was haggling for a better salary—meant that none of the experts arrived in New York until after the September 12 deadline came and went. Eventually, the panel was up and running in October 2009. But it was not an auspicious start. This disagreement was at the heart of the Chinese representative’s refusal to sign the 2011 report. (He’s a nice enough fellow, by the way. After I posted a leaked copy of the 2010 report on my blog, he saw me at a conference in Beijing and, more than a little ruefully, said, “I see you got a copy of our report.” It was not a compliment!) It is clear that the Chinese continue to view the POE as a punitive mechanism, one that is less about monitoring the implementation of sanctions on the DPRK and more about generating negative press attention regarding the DPRK and China. Obviously, there is an element of special pleading in the Chinese case. When push came to shove, they were willing to permit publication of the report as long as it didn’t smear their name. Pyongyang is on its own. Still, it is worth asking whether the Panel of Experts is striking the right balance given the difficult situation. The UN Security Council has now extended the mandate of the POE three times—most recently for one year through July 12, 2013. I am hardly going to suggest that the UNSC disband the POE. At least one of the members is a colleague, and I don’t, as a rule, root for my friends to lose their jobs. Perhaps, instead, we might ask how to best utilize the considerable talents assembled on the POE. The Chinese and Russians, it must be admitted, have a point about whether regularly detailing North Korea’s violations of sanctions is something that should continue in the event that Six Party Talks enters one of its occasional phases of activity. North Korea tends to react badly to such things—although the notion of the North Koreans as being thin-skinned is a little much to swallow given the vitriol that pours out of KCNA and other state media. Could the Panel of Experts serve its essential functions without generating the sort of headlines that we’ve seen recently? I think the answer is “yes”—the mandate of the POE could be adjusted to make fewer headlines without compromising sanctions implementation or the public’s right to know. First, the Panel of Experts can continue to provide routine analysis of incidents reported by states. Although the annual report gets all the press attention, the more mundane work of generating incident reports is the POE’s bread-and-butter when it comes to staffing the 1718 Committee. When a state interdicts a North Korean shipment of contraband, the POE plays an important role in preparing an incident report for the members of the sanctions committee. These reports could be released publicly, in the form of “Implementation Assistance Notices,” without attracting the same media attention generated by a thick annual report. In any given year there are a dozen or so incidents reported by states, usually which are covered by the media at the time. Western press outlets would be unlikely to cover monthly reports by an obscure UN panel, particularly if the seizure had been previously reported in the press. It is actually possible to imagine the POE making more information available, closer to real-time, but in a manner that is less provocative. Don’t believe me? Name a single media outlet that covered either the 2009 or 2010 Implementation Assistance Notices issued regarding Iran. The answer is none—largely, I suspect, because the interdictions on which they were based had been covered in the press in the preceding months. Second, the Panel of Experts could call off the fishing expeditions. When a state reports a violation, the POE is ideally suited to gather information that will assist in sanctions implementation. In one leaked cable, US Ambassador to the United Nations Susan Rice encouraged the POE to go beyond state-reported incidents to “following its own leads,” which is more or less what the Panel was doing with regard to the Chinese TELs that showed up in North Korea. The POE might be an excellent resource if, for example, the Sanctions Committee were to raise the issue with Beijing. Perhaps Beijing would be willing to invite the Panel of Experts as representatives of the Security Council. Even if Beijing refuses, the POE can certainly collect and analyze the available open source information for the 1718 Committee. But in terms of staff and resources, the Panel of Experts is not U.N.C.L.E., CONTROL, or the Office of Unspecified Services. It isn’t even INTERPOL. With only seven full time staff, the POE should probably leave investigations to actual intelligence and law enforcement agencies. Finally, the Panel of Experts could provide an annual report that considers broad patterns in sanctions implementation based on national reporting. Although it didn’t garner any headlines, one of the more enlightening sections of the 2012 Annual Report is the list showing how different states interpret the term “luxury goods.” (The best part regards which items various states designate as “alcoholic drinks” under sanctions. Essentially, every state uses either “wines and spirits” or “alcoholic beverages” to designate items that are considered luxury goods. Except, of course, Russia, which only controls Cognac, wines, and other liquors for more than 5,000 rubles” or about 150 USD. Vodka is apparently a necessity, not a luxury, in Russia.) The Panel of Experts also examined which states submitted implementation reports. Looking at sanctions implementation in this manner seems very helpful. These three simple adjustments—focusing on incident reports, canceling the fishing expeditions, and assessing state-level compliance—would make the POE a much stronger institution and help insulate it from the political disagreements that attend any discussion of North Korea. Any expert group that deals with North Korea is going to be affected by the political divisions within the Security Council. As far as I can tell, the DPRK POE does not operate so differently from other panels. What is different is the complex relationship between the PRC and the DPRK, which complicates not just the work of the POE, but the implementation of the sanctions in general. Managing these tensions, in my view, requires focusing on the core mission of staffing the 1718 Committee and assisting states with the implementation of sanctions, including harmonizing lists and sharing best practices. In cases where states or the open source media report interdictions, the Panel of Experts can be a resource, both for the UNSC as a whole and often for the state in question. These are important and vital functions, even if they are a bit boring. But perhaps boring ought to be the goal. A copy of the report can be found at http://www.ncnk.org/resources/publications/Panel-of-Experts-May-2012-Report-UNSCR-1874.pdf. The missiles themselves were quite possibly mock-ups, with experts disagreeing about how convincing they were and whether they represented an actual North Korean missile under development. But I digress. As of this writing, no Latin American has been added to the Sudan POE, although the staff has turned over completely. For confused readers, I am kidding a bit. U.N.C.L.E. is the international Law Enforcement Agency in the 1960s television program The Man from U.N.C.L.E., starring Robert Vaughn. UNCLE is lampooned as CONTROL in Get Smart. The Office of Unspecified Services is from David Foster Wallace’s book, Infinite Jest. INTERPOL is, of course, real, but with about the same law enforcement powers of the band of the same name.